Whether you are skilled at woodwork or do-it-yourself home projects, or if you are just beginning to do work in these areas, you might want to know a little bit about the best electric, cordless, 18 gauge brad nailers. This article will give you a little background information about brad nailers, including when to use one instead of a finish nailer, help you decide which one might be best for you with the top 2019 brad nailer reviews, and then spend some time explaining how to use a brad nailer in case you haven’t had the chance to use one before. 1 What Is A Brad Nailer? Brad nailers can sometimes be confused with finish nailers, and since the two often look somewhat alike and use almost the same nails, it can definitely be confusing to those who aren’t familiar with both! However, it is important to remember that a brad nailer is a bit smaller than a finish nailer (not by much, but noticeable), and are used for projects that don’t need as much holding power because the “nails” in a brad nailer aren’t actually nails at all. When you are choosing between a brad nailer and a finish nailer, it is important to consider the job that you are going to be doing. If you are planning on doing a project such as paneling or using drywall, you’ll want to choose a finish nailer. If you are only doing something small, such as attaching a very lightweight trim, a brad nailer would be the better choice, as a brad nailer isn’t as likely to be as visible as a finish nailer would be. A brad nailer is ideal for more delicate projects, such as trim or decorative work, and when attaching smaller pieces to wood. There are also different kind of brads to choose for specific projects, which we will talk about in the next section. Brad nails come in different sizes for different kinds of projects, including smaller nails for more delicate work, and larger ones for attaching trim and other pieces to woodwork. For an 18 gauge brad nailer, the nail sizes range from 5/8 inch long to 1-1/2 inches long, and tend to be longer and skinnier than brads from other nailers, such as the fifteen gauge. This makes it a lot easier to get to those delicate areas or the areas that need a bit of a longer nail to be held in place, like lightweight trim on woodwork or around your home. Now that we’ve talked about the size and length of the nails that can be used in a brad nailer, let’s talk about the different types of brad nailers themselves. Some brad nailers are cordless, and some are electric – the choice is really up to you, but cordless versions allow you to move around more with them and get more work done without having to worry about finding an outlet. Brad nailers are also available in different sizes, such as 15 gauge and 18 gauge. The 18 gauge is more versatile and easy to use, and there are plenty of more ways to use this model, so it tends to be the most popular along carpenters and do-it-yourself enthusiasts. If you are looking for a good quality brad nailer, you’re going to want to look into one that is made from durable materials. You will end up paying a bit more for a quality brad nailer that is made from durable materials and that has specific additions that allow you to run the motor longer without it becoming an issue and damaging your tool. For example, you want to choose a brad nailer that has an adjustable exhaust, so that the debris from the nailer is pushed away instead of entering the tool, causing malfunction. It is also important to find a nailer that has a good gripping surface and that can withstand a drop or a bump if you plan on working with it for a long time. Brad nailers are already a relatively safe tool, but of course, there are ways you can keep yourself even safer during use. For one, make sure you wear safety goggles no matter what tool you are working with. While a brad nailer doesn’t use as much compressed air as other equipment, it shouldn’t be as loud, but still make sure to wear hearing protection if needed. Many of the newer models of brad nailers have safety precautions built right in, such as a trigger guard that makes sure that the nailer does not keep firing nails if the trigger gets stuck. This very versatile brad nailer from WEN can fire brads that measure from ¾” in length all the way up to brads that are two inches in size! This is a great tool for those who are looking for something that will work for a variety of different home improvement projects. Operating at 60 to 100 PSI, you can adjust the pressure to change how the brad nailer works quite easily. The nailer is only 3 pounds in weight, thanks to its durable and well-made aluminum body that will stand up to heavy use, bumps, and scrapes from everyday use. The quick release function allows you to clear jams with ease, and the magazine holds one hundred brads, giving you plenty to work with. The brad nailer comes with a carrying case, oil, and adjustment wrenches so that you can put it to work and get the most out of it! This amazing, two in one brad nailer has features that others in its class do not, including the anti-vibration handle that allows you to use the tool for long periods of time without the constant vibrating, which can lead to fatigue. 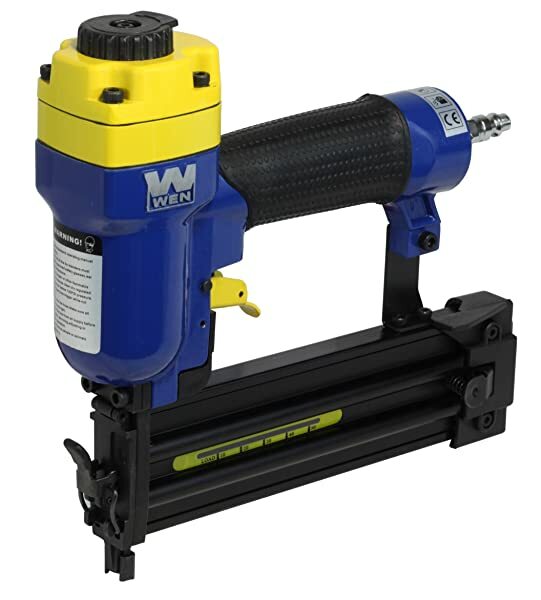 You can also use two different types of fasteners in this brad nailer, as it supports both 18 gauge brad nails and 18 gauge ¼” narrow crown staples, with a wide variety of sizes accepted for both. The durable brad nailer has been created with only the best in materials, including a lightweight aluminum housing that can withstand bumps and scrapes easily. This nailer gives you everything that you need for an assortment of projects. It has a fully adjustable exhaust to keep air away from your workspace, sequential fire mode to fire only one fastener at a time if needed, and a reload indicator so that you can easily figure out when you need to add more brads into the magazine. The no-mar safety contact on the bottom of the nailer prevents it from firing unless it’s safely contacting the surface you want to work with. 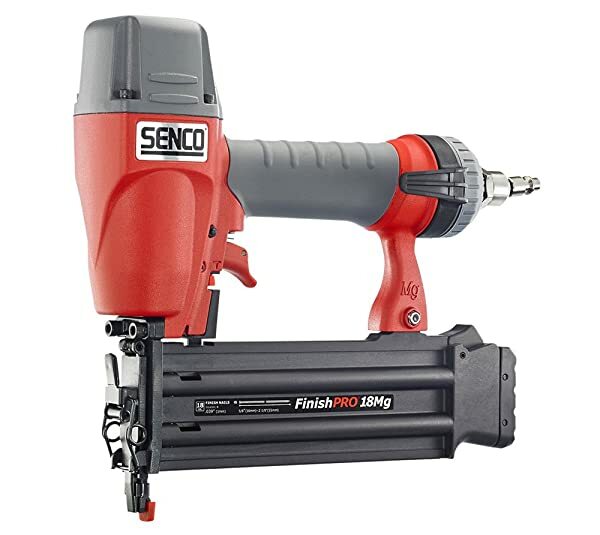 This easy to use brad nailer from SENCO FinishPro makes getting your home improvement projects finished up a breeze! The highly durable housing will have you feeling safer about using the nailer, and the oil-free design gives you the chance to get your work completed without having to reapply oil to the tool over and over again! The selective trigger is great for choosing whether you wish to use a faster placement of the brads or only place one brad at a time. The rear exhaust gives you the ability to work without worrying about the exhaust and air flow interfering with your workspace. This model has the ability to drive up to 2 1/8” brads, so you have a wide selection and can be useful for many projects! The snazzy colors allow it to be easy to locate in your tool kit, and it comes with a hard shell case that will keep it safe during transport. 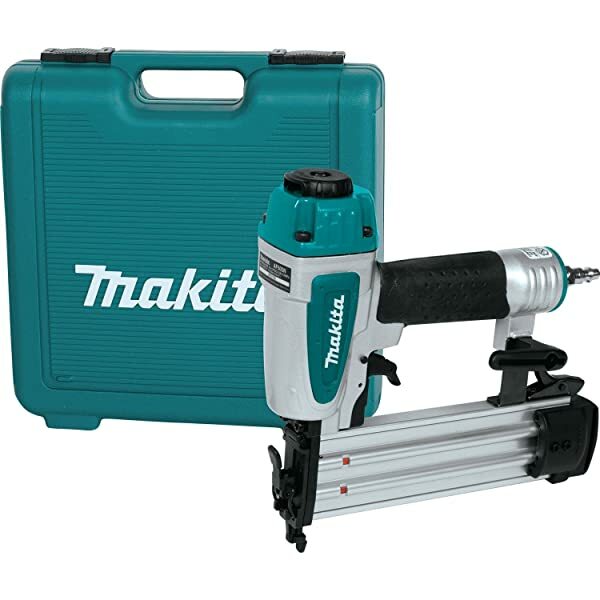 Makita is a well-known tool brand, and this brad nailer, which can fire up to two-inch brads, is a great tool to pick up when you need a nailer that will work for a variety of different size brads. The narrow nose of this nailer makes it easy to get into the most precise areas, giving you full access to hard to reach places. The tool-less quick release can be quite helpful when it comes to clearing jams out of your brad nailer, and the depth adjustment dial is also tool-free, so you can quickly choose the depth you want to use for your brads. The rubber nose on the Makita brad nailer is non-marring, so you don’t have to worry about damaging the wood that you are working with. The exhaust port rotates fully to prevent the exhaust from getting in your workspace. The low brad indicator will alert you when you are low on brads so that you can prevent any dry firing from occurring, and the magazine capacity on this brad nailer is one hundred. 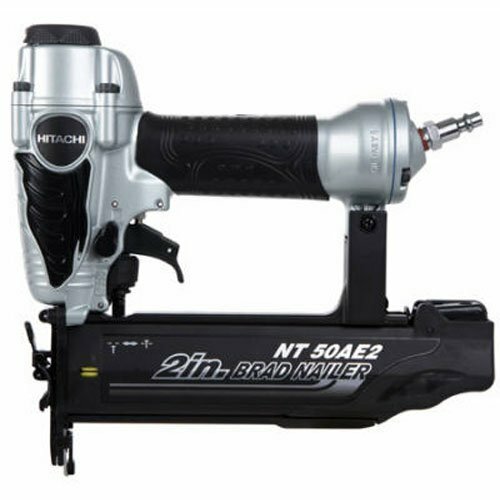 A very reputable name brand, the Hitachi NT50AE2 18-Gauge 5/8 inch to 2 inch brad nailer requires an air compressor, but delivers plenty of power for what you get! You have two modes available to you – a mode for constant shooting and a mode for one time firing, and the modes are easy to switch between. The unit weights only 2.2 pounds, making it incredibly lightweight, and it also features an easy gripping surface to prevent the tool from slipping from your hands during working. The easy clearing nose of the unit allows you to clear jams and remove nails without needing additional tools to do the job. The unit also feels a depth of drive wheel to give you the option to choose how deep you want your nails to be driven into a surface. The 100 nail capacity magazine can readily fire nails from 5/8 inch – 2 inches in size. This unit has the tendency to jam often due to the nails slipping outside of the spring loaded plate. While the jam can be cleared easily, it can get somewhat annoying to have to clear them in the middle of a project. 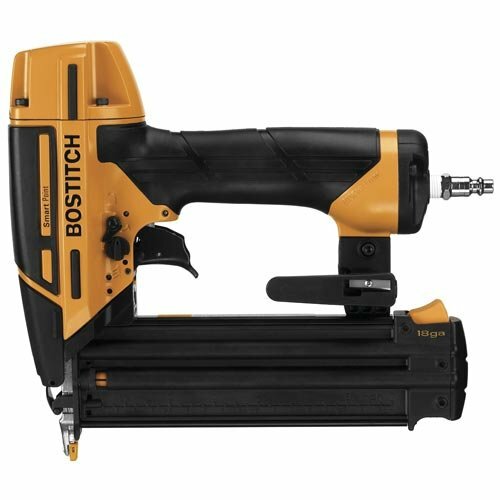 The BOSTITCH BTFP12233 Smart Point 18GA brad nailer is an incredibly accurate nailer from a trusted company that will help you with your lighter wood or paneling projects. The unit is very versatile when it comes to brad nail sizes, as it accepts nails from 5/8 inch – 2 1/8 inches. The nailer uses smart point technology which allows you to accurately place your brad nails. The tool free jam release allows you to clear jams in the unit without having to pick up other tools. Dial a Depth Control is a special part of this tool, as it allows you to choose the depth at which you want your nails to fire, making your project easier to complete. A selectable trigger gives you the choice between selective and constant operation, and the adjustable belt loop will have you keeping your unit in place. The unit can jam often, and while this might be annoying, the tool free jam release will give you the chance to clear the jams without a secondary tool. 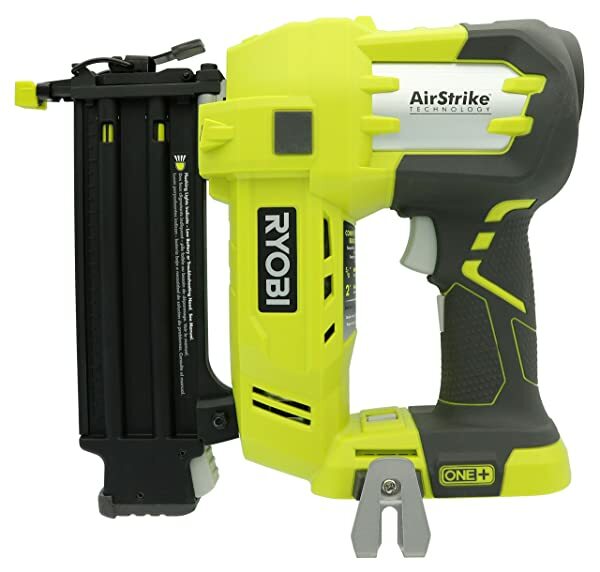 If you are looking for a powerhouse of a brad nailer that doesn’t have any cords holding you back, this Ryobi brad nailer, which is the best cordless brad nailer on our list, is a great choice for you for all your home improvement and commercial construction projects! There is no compressor needed when it comes to this brad nailer – you only need a lithium ion battery or a NiCad battery in order to power this. You can get up to seven hundred brad nails on a single charge with a battery from the same company, so you can always rest assured that you will get plenty of brads fired for each battery. You won’t damage your wood by accidentally dry firing when the unit is out of brads, either – a dry-fire lockout mechanism will keep it from accidentally firing if you were to run out of brads. The dual LED lights to give you the ability to really see what you’re doing – perfect for those hard to reach places and tight corners. 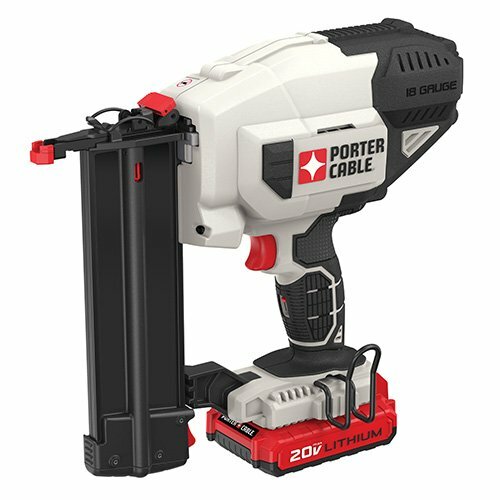 The Porter-Cable PCC790LA 20V MAX Lithium 18GA is a great cordless brad nailer that offers plenty of power. The versatile 18 gauge nailer is perfect for doing a lot of lighter working. The fact that the unit is powered by a battery means that you won’t need to use an air compressor when working. The unit includes a battery charger, and the unit boasts the ability to fire over one thousand nails per charge. The tool free stall release lever and the tool free jam release are not just convenient for you, but they are also great safety measures that will help you while working. The depth adjustment window and tool free depth adjustment wheel allow you to choose how deep your nails go. The unit can accommodate nails ranging from 5/8 inch – 2 inches, and has a magazine capacity of 100 nails. This unit has been known to have a manufacturing defect that makes the brad nailer turn on with the lights blinking, but the nails do not shoot out of the unit. This seems to have been fixed in newer units. 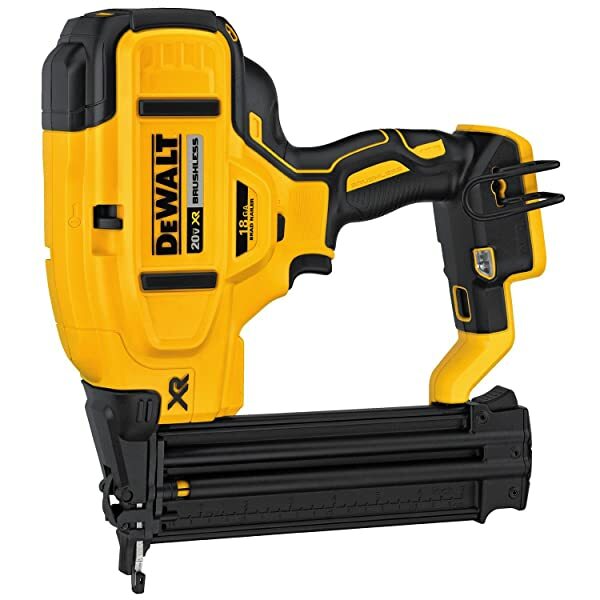 You can’t go wrong with one of the very best power tool brands on the market, and this DeWalt 18 gauge brad nailer is hard to beat. This brad nailer is cordless, which allows you to take it with you on the go without worrying about an air compressor, and has several features that really set this unit apart from others. For one, the diagnostics LED communicator indicator helps you to figure out what’s wrong with the unit if it should malfunction, as well as how much battery level is left (or if it is completed with charging). The automatic shut-off is perfect for conserving battery life – you don’t need to worry that you are wasting battery if you accidentally forget to switch the unit off. The micro nose design gives you better sight and nail placement, and the brushless motor gives you a longer runtime and a more durable power tool. When you first purchase your brad nailer, you may wonder how to use it. The first thing you need to do after purchasing your brad nailer, especially if it is a model that requires an air compressor, is to make sure you have the right size hose adapter so that it fits with your compressor. If you are using a battery charged unit, then you should charge the battery prior to use. Once you have this step taken care of, the next is to choose a nail size for the project you are working on. Say, for example, that you are using them to install a decorative piece on a wooden cabinet or other fixture. Choose a smaller brad nail so that they are not visible and do not go through the other side of your wood. If you are planning on only using one nail at a time, you will want to use your adjustable trigger to select sequential mode. If you want to use a continuous shooting method, then switching to “bump” mode may be the way to go. Next, aim your device, and deploy the trigger. This will shoot the nail where you want it to go. If you need to repeat this step, continue to do so until your project is completed. When you finished, you can remove the magazine and add more nails if you plan on using it again, or you can disconnect the unit from the battery or the air compressor and store it safely. If your unit jams, some of them have a tool-free jam release, which allows you to eject the magazine and clear the jam without using another tool to get the nail out. Some models have other features, such as trigger locks, that you can use when you aren’t planning on using the unit for a while. This can prevent misfires and other potentially dangerous situations. It is important to use any safety features that you might have available to you with your brad nailer so that you can be sure that you and those around you have a reduced risk of injury. If you run into an issue with your brad nailer, many companies offer warranties with the purchase of a new brad nailer, and you can contact them if you need a replacement, refund, or parts for your brad nailer. Higher-end companies also offer to service so that you don’t need to worry about repairing the nailer yourself. Choosing a brad nailer can feel a bit overwhelming, especially since there are so many different brands and models on the market. A general rule to keep in mind is to purchase the best nailer that you can afford. Once you have a good understanding of how to use a brad nailer (and after a bit of practice), you’ll be ready to go to complete a variety of projects that require a smaller, more precise nail than a traditional finish nailer. It is important to keep in mind that these types of tools are not ideal for drywall or heavier construction projects like a finish nailer, but they are designed for framing, trim, and lighter woodwork. Didn’t know about brad nailers until now. 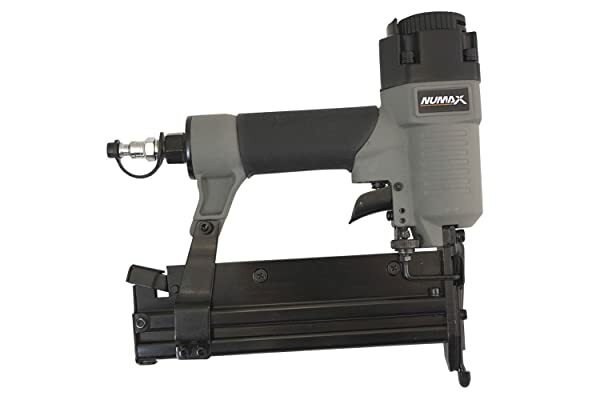 I was thinking about getting a finish nailer because I thought that would be the best (and maybe only) option for my projects around the house. I now think I’m going to need both of them to make things look great. I’m thinking of getting that cheap brad nailer you mentioned from WEN. I don’t want to spend a lot of money on something I might need once in a while but I also don’t want to be without one as the finishing it has is very different from a more powerful finish nailer.